Spaghetti with Pesto Meatballs, quick, easy pasta dish. The pesto flavors both the meatballs and the sauce in this simple recipe. They cook together in one pan making life a bit easier. Lightly beat egg with a fork. Add pesto, bread crumbs, wine and mix well. Add beef, mix well (use your hands). Form into meatballs, about 1 1/2" (5cm) in diameter. In large nonstick skillet heat oil over medium heat. Add paprika and sauté briefly. Add onions and garlic. Sauté until tender and onion is transparent, 7 - 8 minutes. Add tomatoes, sauce and herbs. Heat to a simmer. 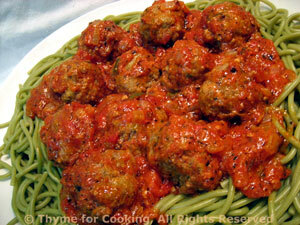 Pour meatballs and sauce over the top, remove bay leaf, sprinkle with Parmesan and serve.